If you need to make any changes to the enrollment form, click on the Edit Form button in the upper right. This will take you to where your form lives on the website. 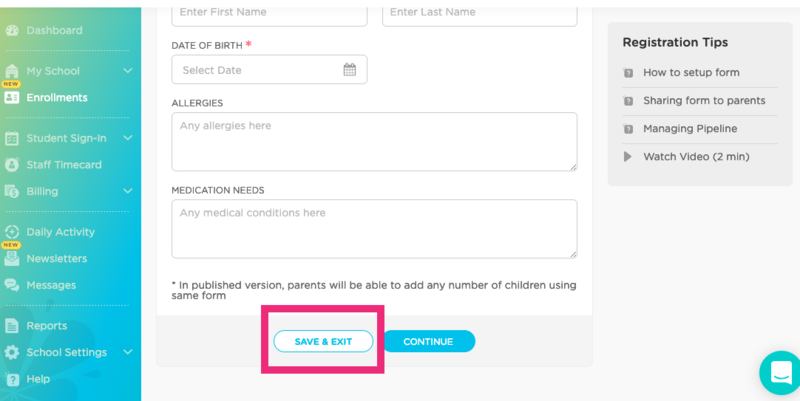 If you only want to make changes to the form itself, click through the Student Info, Parent Information, Authorized Pickup Info, and Policy & Waiver tabs, then click the "Save and Exit" button at the bottom. If you only want to make changes to your enrollment fee, click directly on the #2 circle for "Add Payment Method." Once you have made your changes, click "Continue" at the bottom, then the "Publish Form" button again to save your changes. Here is the link to our help article on how to Share the Form.